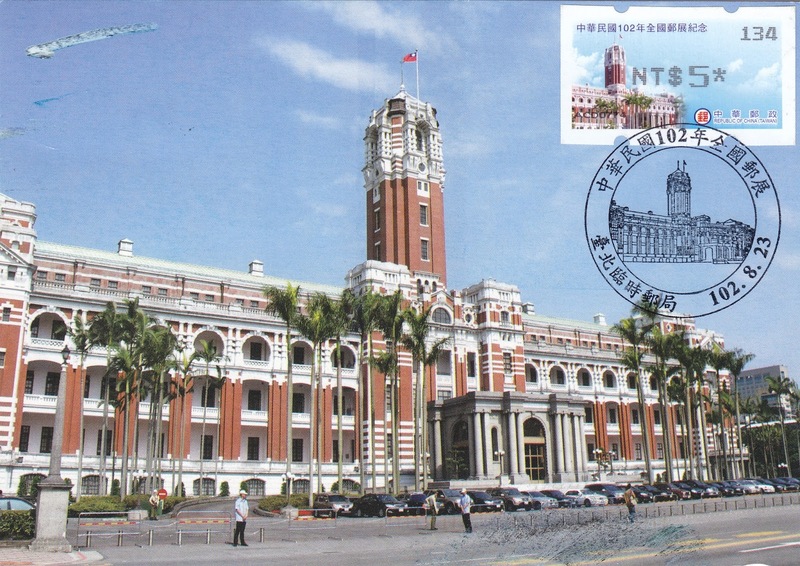 Today's featured postcard was a private swap from Taiwan showing the Office of the President, Republic of China in Taipei with a ROCUPEX '13 TAIPEI commemorative postage label from the 2013 National Stamp Exhibition of R.O.C. and International Invitational Stamp Exhibition, and a matching pictorial postmark on August 23, 2013. 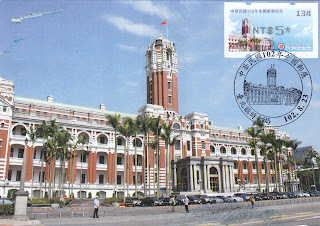 The Office of the President is the site of the inauguration ceremony this Friday, May 20, 2016 where Tsai Ing-wen took oath of office to become the first female president of Taiwan. Tsai Ing Wen (R) replaces former President Ma Ying Jeou (L) after a landslide election victory on January 16, 2016. She faces immediate challenges to revitalize the economy, and to balance the demands of the her electorate for greater independence and the pressure of One-Country from China.